Andover Town Hall is located at 17 School Road, Andover CT 06232; phone: 860-742-7305. 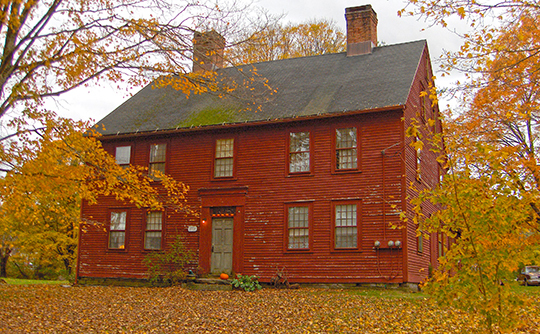 Photo: Circa 1773 home (former White's Tavern), 131 U.S. Route 6, Andover, CT. Listed on the National Register of Historic Places in 1991. Photographed by User:Sphilbrick (own work), 2010, [cc-by-3.0 (creativecommons.org/licenses/by/3.0)], via Wikimedia Commons, accessed January, 2014. The first settlement was made in 1713 in the southeast part of the present town. Portions of Lebanon, Hebron, and Coventry joined to form the Ecclesiastical Society of Andover, which was recognized by the General Assembly in May, 1747. Daniel Burnap, famous clock-maker, was born here in 1759. Major John Hutchinson Buell, native and resident of Andover, served throughout the Revolution and later in the Indian wars in Ohio. Rochambeau's army of six thousand marched through Andover in 1781 to the siege of Yorktown in Virginia and camped here on their return trip the following year. In 1848 the town was incorporated, the railroad came, and small industries prospered. State of Connecticut Historical Marker, Connecticut Historical Commission, erected 1976.